You are here: Home / Bread / Pumpkin Cinnamon Duffins! It’s a donut…It’s a muffin…It’s a Duffin! This delicious mix of muffins and donuts are a cinch to make and will make your whole family smile! I don’t say this about every recipe (okay…I say this about every recipe). But you really need to try these! These little things melt in your mouth. 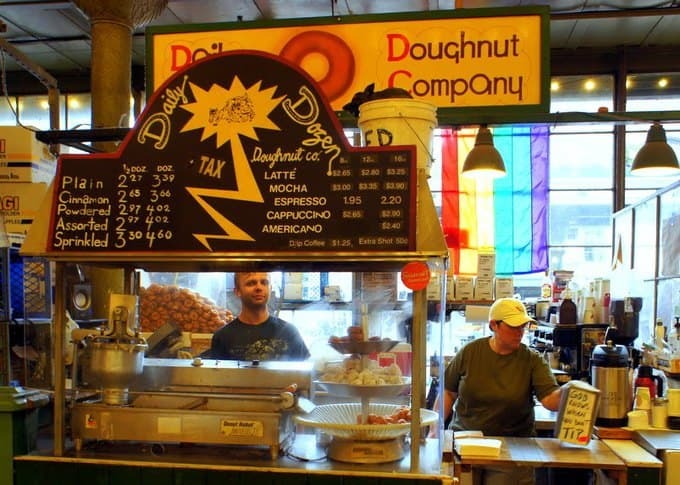 At our Seattle Pike Place Market, we have a little donut stall that pumps out little tiny donuts all day long. 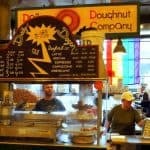 It’s called Daily Dozen and it’s a Seattle Foodie landmark. I have been going there since I was a child. These are the donuts that I measure all other donuts against. 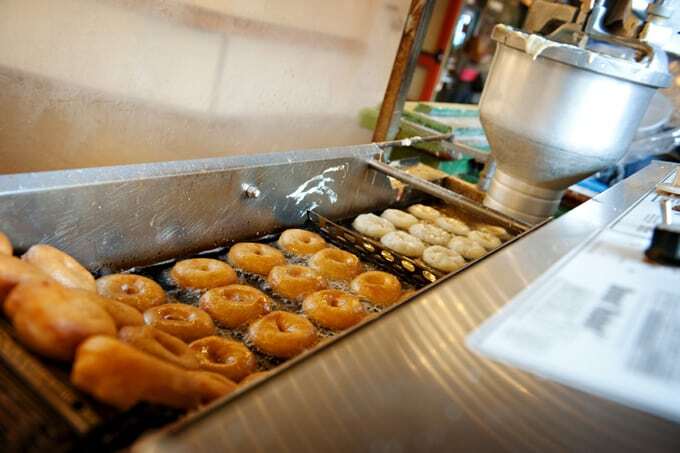 Now I’m not saying my Duffins taste exactly like the Daily Dozen Donuts…but they are reminiscent. It’s the first thing Mr. Laughing Spatula said (right after he wiped the cinnamon sugar dust off his mouth). 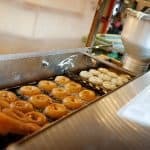 These baked up little treats have a fresh donut taste without all the grease (my arteries are thanking me and insist I have another!). I used a cake pop baking pan but a mini cupcake pan or mini donut pan would work just as well. You could use a full size muffin tin but you miss the donut experience just a tick – but don’t let it stop you! These are yummy no matter what you bake them in! Make lots and share with those you love – it’s a love Duffin! Share, share share ! It's a donut...It's a muffin...It's a Duffin! 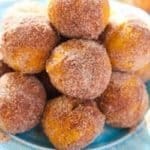 This delicious mix of muffins and donuts are a cinch to make and will make your whole family smile! Using non stick spray - coat your muffin or donut pan. In large mixing bowl - combine flour, baking powder, salt and pumpkin pie spice. In separate smaller bowl - combine pumpkin puree, melted butter, brown sugar, egg, vanilla and milk. Pour wet ingredients into dry ingredients. Mix but do not over mix. Bake for about 12-15 minutes or until a toothpick inserted comes out clean. While muffins bake. Melt butter in large flat surfaced bowl. Combine sugar and cinnamon and pour onto plate. Roll slightly cooled muffins in melted butter and toss well with cinnamon sugar mixture. 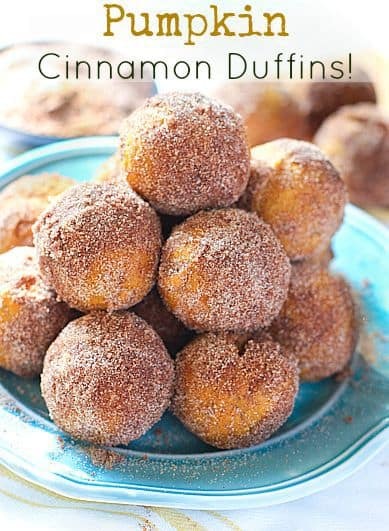 I made these and then I switched it up and made Apple Cinnamon ones, only issue I am having is they are very dense going to work with the recipe a bit to see if I can’t fix that 🙂 Otherwise these are amazing super yummy treat for my husband daily in his lunch! Hi Lacey! They are indeed very dense. Dense duffins! So glad you liked them and thanks for the nice comment.